As part of an ongoing relationship with Hoppecke Batterien, Acres produce a number of bespoke fork-truck battery changing solutions to suit customer requirements. Our product has improved incrementally over the years giving our designers and fabricators a wealth of experience to tackle almost any request. 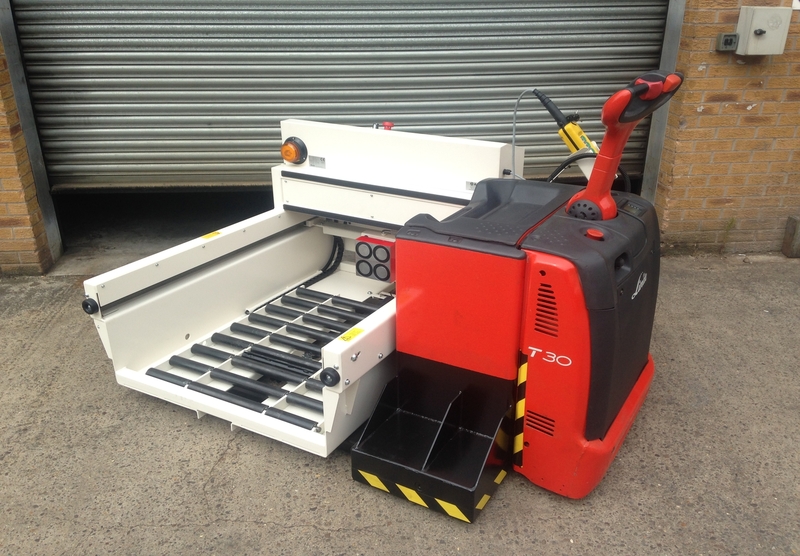 The Acres PU machine is fixed to a PPT (Powered Pallet Truck) providing a fast and efficient mobile battery changing solution for warehouse operations. The PU is powered by a hydraulic power pack which, in partnership with a pair of powerful magnets exchanges batteries between fork trucks and battery charging racks. For more information about the Hoppecke battery changing solution see: The trak® Xchange PU. This bespoke battery changing solution is fixed at 90 degrees to a modified PPT (Powered Pallet Truck) providing a solution for warehouse operations with space restrictions. A 1250mm X 1000mm bed size has been created to accommodate very large batteries. The pendant controller enables full control from the side of the unit. A hydraulic assisted braked roller secures the battery during transit.